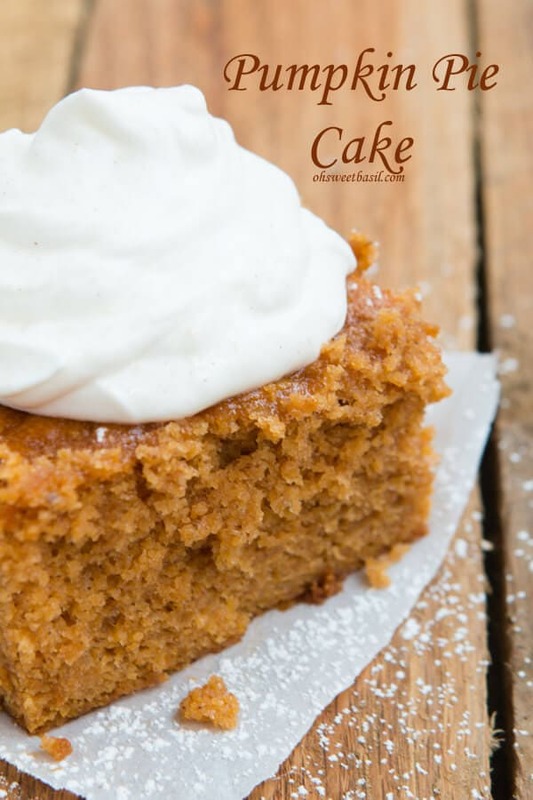 The BEST pumpkin pie cake ever! Mom’s recipes are truly everyone’s favorites and we couldn’t wait to share with you this one! I love my mom. I bet you love your mom too, but I just truly adore mine. She’s so darn giving, slow to get angry, and quick to give love. She’s a fantastic listener and good mercy is she a hard worker. My mom keeps the best garden all summer long, freezes, cans and stores like all of it, which is pretty amazing considering her garden is bigger than most back yards. But outside of all of that I love my mom’s cooking. Well, not goulash, but the rest. 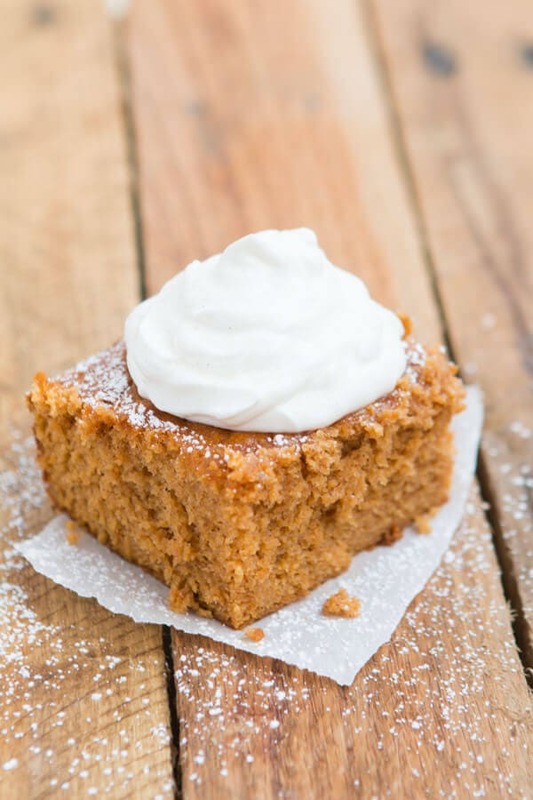 Like this pumpkin pie cake recipe. Mom grew up in a little farming town and so her meals are good, basic, home cookin’ meals and I love that. 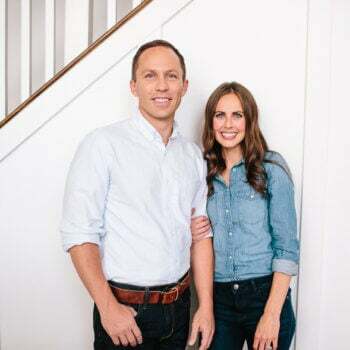 Her cheesy rice and ground beef casserole and taco stew are literally our top two recipes on the site and many of her others are up there as well. How awesome is that? 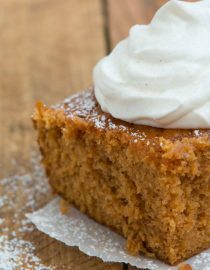 I love that some of her recipes use gobs of fresh foods and good meats while others are super quick and easy like this pumpkin pie cake. 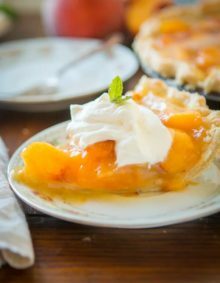 It only uses a few ingredients and it literally tastes like pumpkin pie but with a soft, delicate texture of a cake. So the pie haters can still have their pumpkin without the texture issue of the pie filling. Which I honestly don’t understand as I’ve really grown to adore pumpkin pie, but to each his own. It is packed with fiber, potassium, and vitamin C.
Pumpkin is rich in Vitamin A which is good for your eyes. Because pumpkin pie is made with eggs and milk, it should be kept in the refrigerator after baking. Pumpkin Pie will keep for 3-4 days in the refrigerator. Can Pumpkin Pie Cake Be Frozen? Pumpkin pie cake will freeze very well. Just wrap it tightly in plastic wrap or foil and freeze for up to 2-3 months. Preheat the oven to 350 degrees and spray a 9×13″ baking pan with nonstick spray. In the standing mixer, cream the butter and sugar until smooth. Add the pumpkin and mix until smooth. Add the eggs, one at a time, mixing between. In a separate bowl, add the salt, pumpkin pie spice, and yellow cake mix. Pour into the pan and bake for 40-45 minutes. You may substitute 2 teaspoons cinnamon, 1/2 teaspoon cloves, and 1/2 teaspoon ginger if you don’t have pumpkin pie spice. 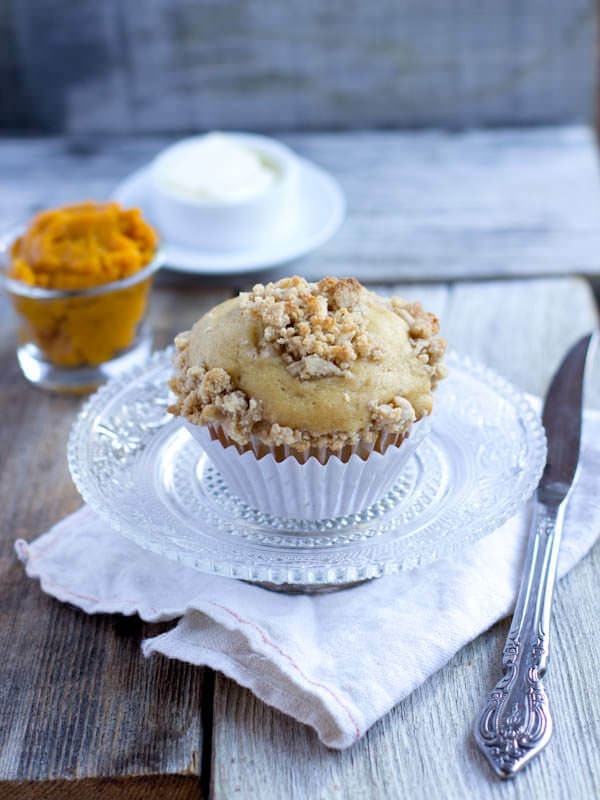 I love when the air turns chilly and the wind starts to blog because I know it’s time for pumpkin crumb muffins again. 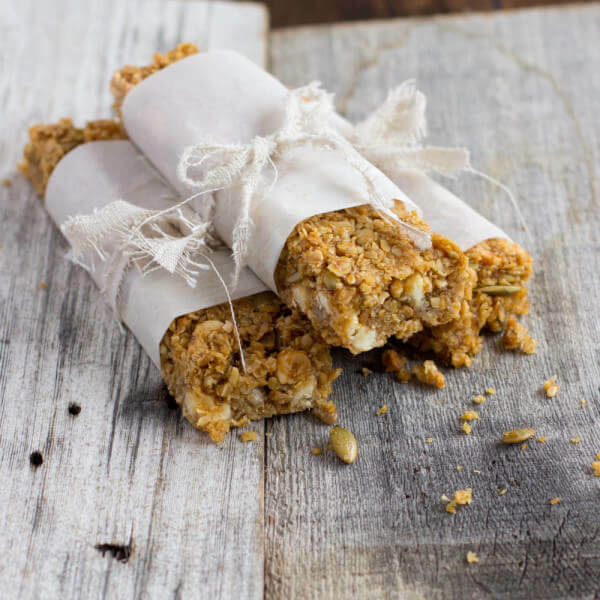 It’s not just that these granola bars are homemade that makes them wonderful, it’s also those little bits of white chocolate that melt in your mouth! Ive made this for years in a bundt pan with regular milk snd a spice cake mix. 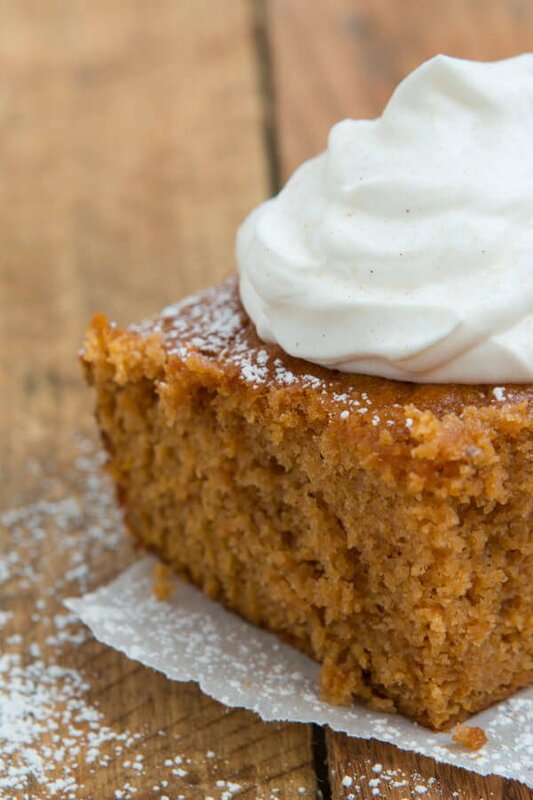 It makes the best pumpkin gingerbread cake. Drizzle with maple syrup or molasses, or frost with cream cheese, milk, and confectioners sugar, or dust with confectioners sugar. Yes, but then you can omit adding the pumpkin pie spice since the pumpkin pie mix already has spices in it. Enjoy! I just finished baking this. I had to bake it longer. Oven temps vary so much. I did not have whipping cream, so I used 1-1/2 cups powdered sugar, 1/2 stick of melted butter and 1/4 cup of apple cider to make a glaze. It was delicious. Thanks for the note on pumpkin pie spice. I used 1 tsp. of cinnamon and 1/4 tsp of apple pie spice because my family is not a big fan of pumpkin pie spice. Great recipe. Um, wow. That glaze with the apple cider is an awesome idea!! I’ve marked it on my recipe to make sure to try it! Made this today – I took it out after about 15 min longer cooking time (brand new stove that seems to cook everything fine) 🙂 the edges were slightly higher at that point but within a couple minutes the center took a nose dive :-/ it settled almost 1/2 inch lower so I didn’t think it was pretty enough to just serve with whipped cream so I made a simple cream cheese frosting. It was delicious and everyone wanted to take an extra pc home. 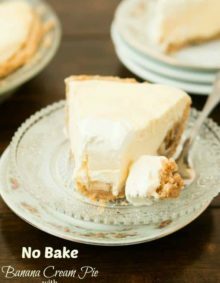 The cake was very moist, very tasty, (I think it would have been awesome even without the cream cheese frosting – did that more for looks – great recipe even if it didn’t turn out quite as pretty! Oh and I did use the yellow cake mix – nummy! Question; If I use a Spice cake mix do I still need to add the spices? I was wondering the same thing? I hope she answers you. I was hoping to make this over the weekend. Thank you. 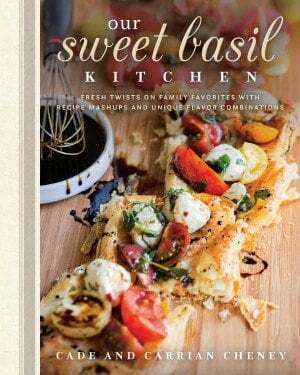 I’m making this today since the office is closed due to Hermine. Oh please be safe! Where are you located? We often add half of the spices or a pinch of pumpkin pie spice but that’s it when it’s the spice cake. Great question! I have just made this cake, and i baked it in a bundt pan for 70mins it turned out absolutely delicious!!! Thanks for sharing your recipes!!! Love that you did it as a bundt! Thank you for sharing! Hi. Your recipe might be useful to me. I’m planning something different. Would you know if this cake would survive being “poked” and filled with pumpkin pudding? Also, I need to use a 10 x 14 spring form pan. Would you know if a cake extender will work for this? 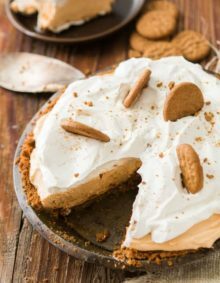 This pumpkin pie cake looks delicious….I too dislike pumpkin pie, but love pumpkin anything else lol…..can you believe that ? Love pumpkins donuts too…..yum and pumpkin cookies…..just not the pie….my favorite is the Pecan pie or a butterscotch pie……love them both….. thanks for posting this recipe…..
Sooo I’m baking this as I type and it has been in the oven for 50 mins and is still very raw in the middle…. The cake should be springy but the center should move a little. If it’s very raw in the middle I worry that the oven isn’t keeping a strong constant temperature which is very important in a pumpkin cake recipe. I would cover it with foil to keep the top moist and bake until set, but also avoid opening the door when baking as it can quickly lower the temperature. Lauren, it also appears that it was showing double the eggs, it should only be 3. I’ve checked and the error has been resolved. Sorry about that! This looks amazing! And I love that it uses a cake mix! Easy!!! Recipe showed I large can of pumpkin which is 28oz so I used 2 small 15oz.. I seen ur post where it was 1 14oz.. Which was it? My cake wasn’t done at 45 minutes,so I put it back in for 20 more minutes,not done,finally back in for 10 minutes done,baked it in a 9×13 pan at 350 so don’t know what happened. I’m sorry that happened for you. Have you checked your oven and made sure that it’s staying at the same temperature? That’s a long time for a 9×13″ cake which generally is 30-35 min for baking and this recipe is 45 which should have been more than perfect as we’ve been doing it for 30 years. I would for sure check on that oven and make sure the door is never getting opened or the temperature will be lost. Good luck! I am having the same problem…….mine has been in for almost 65 minutes, and just now finally getting done! Smells and looks yummy! Thank you for the recipe! I’m having the same problem… The first one I made 1 lg can of pumpkin was way too much and it took over and hour to bake… It turned out more like a bread pudding. I tried it again but only used 1 1/2 can but it still too over an hour… ???? I’m going to start testing and I’ll report back soon! Stick with me and we will figure it out. 🙂 For one thing, I know that my mom’s always comes out more like a pudding cake as in the bottom has a pumpkin layer, but mine is always cooked through, so maybe it’s actually my oven with the issues and I didn’t know until now. Yikes! Thanks for your patience and chat soon! Hi Sally! I’ve been testing and testing over here and I’m pretty much eating a fat slice of humble pie and preparing to beg for your forgiveness, so here goes… In the holiday bustle I had written down 3 cups of the puree when I was measuring out cans, mistakenly too close to mom’s recipe which is in face 1 15 ounce can of pumpkin. I am totally embarrassed and just could not figure out the problem until it finally dawned on me what I had done. Please accept my apologies and I promise to not be so sloppy in note taking again. There should be only 3 eggs, I just noticed that there was an error and it was showing up with half the recipe as double the amounts. Thanks for your patience~! HI Kim, please see my note to Sally and accept my humble apologies. Hi Olga, please see my note above to Sally and accept my apologies. The recipe has been corrected. making it right now how about if I put it in two round cake dishes how long would it bake? I have not done it in two round pans so I’d hate to give you the wrong time, but if it were me I’d bake a few minutes longer for 8″ and about the same time for 9″ pans. Good luck! On this page, the sugar amount says 1 1/2; however on the main page of Yummly, it says 1/2. Just want to make sure that I do not add too much or too little. Thanks! Oh, how interesting, it’s definitely 1 and 1/2. Thanks so much for checking! Is large can (14 ozs.) of pure pumpkin or the can of pumpkin pie mix? I think I’ll try this with a gluten free cake mix. I hoe it’s just as good! Fresh pumpkin… still 3 cups? large or small can of evaporated milk? Hi I live in Melbourne Australia. Our butter is always weighed. I’m assuming that the 1/2 cup of butter weighs 125 grams or 4 ounces of butter. Did you use the yellow cake mix or the spice? Hi Brittany, this photo is a yellow cake mix but I love both! I loved reading this post, your Mom sounds wonderful! I need to make this cake right now!!! You are the queen of cake, I need one of yours! I love using recipes that have been passed down, they always seem to taste extra special! This cake looks delicious!!! Your mom sounds like the sweetest, just like this cake looks! YUM! Yep, that looks perfect! If I make it in muffin tins, I can call it breakfast! Pumpkin breads and cakes are one of my favorite thanksgiving treats. This looks like a great recipe for the holidays. I can’t wait to try it!